Tai Chi, or Tai Chi Chuan (also known as Taijiquan) has, in some sense become a generic term for a series of often very differing arts with just as many perceptions of what the practice actually is. A good place to start, when looking to understand what the art is, is to look closer at the actual styles and variations in the way they are taught and practiced. Whilst there are many common principles if the varying styles it is helpful to your practice to be clear about which style your are training in and which version of that style you are being taught. In the early days it is said that the original style of taijiquan was the Chen style, which came from Chenjiaguo, in Henan Province, not terribly far from the Shaolin Temple although there is no claim to any connection between these two martial art systems. From the Chen Style came the Yang, via its founder Yang Luchan who, it is said, learned his system from the Chen family after working as a servant in their village and secretly observing their training routines. The Yang Style ultimately beget the Wu Style and beyond these three original styles came a number of others including the Hao, Sun & Li. There are then the many variations or sub-styles that emanated from these orginal family styles and, then again, we have the Wudang style from Wudang mountain is also considered to be the original style, descending from Daoist monk Chang San Feng. 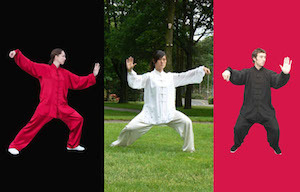 In addition to these ‘major’ tai chi styles there has also been a number of variations in the way they are tauight and practiced, when oftentimes they have been shortened or adapted, either to take out the more physically demanding elements, or to allow students to learn them quicker, such as the Cheng Style which came from Professor Cheng Man-Ching who went from China to Taiwan (as did many others) where he shorted the Yang system which he learned from Yang Chenfu, the grandson of its originator, to allow the army to learn it quickly. He subsquently moved to the USA where he taught, openly attracting many students in the late 1960s – early 1970s. Cheng’s style became one of the first to be popularised in the west and because of this there are still many practitioners around today. In a quest to further popularise the art it was inevitable that competitions would be created. Initially there were obvious difficulties for judges and officials as there were so many variations in ‘family’ styles that it was difficult to find a common standard to evaluate performances. This led to the creation of Combined Competition Routines which included elements of the original three styles, Chen, Yang & Wu show that players were able to learn and demonstrate specific aspects of the arts. Today there are many things that are practiced under the title of tai chi, and though many purists may question some of these systems, they do make the art accessible to all ages and physical abilities. Many shorter forms, some with only 8 movements, have been created to make it easier for people to learn and practice, and some further adaptations have been done to enable those with special requirements to participate and also gain the undoubted benefits from their training. Over the course of these pages we include material on the various styles and adaptations, in a way that will make it easier for you to discern which is which, what the basic principles are, and how best they should be practiced.